I have seen so much (possibly too much) in the last four years that perhaps this is the reason why I forgot having seen this sparkling operatic event before. After praising the English National Opera for the wonderful ensemble they put on stage for their new Hoffmann I am delighted to be able to acknowledge how excellently rehearsed and performed was this much-revived 2006 production by David McVicar of Mozart’s Le nozze di Figaro presented as the final opera in The Royal Opera’s current Mozart-Da Ponte cycle. The composer’s 1786 Le nozze di Figaro (The Marriage of Figaro) is surely an opera that needs no real introduction; its score is possibly Mozart’s finest operatic achievement. And because it contains so much comedy, romance, jealously joy, envy, forgiveness and reconciliation, all set against some memorable tunes, it is the perfect ‘first opera’ and might explain the interesting audience it drew to Covent Garden, many clearly in an opera house for the first time. It is based on Beaumarchais’s 1784 play La folle journée, ou Le Mariage de Figaro, and his sequel Le Barbier de Séville (The Barber of Seville). The latter is familiar to opera audiences through Rossini’s great 1816 prequel in which Count Almaviva, with Figaro’s contrivance, woos Rosina away from her old ward and would-be husband, Doctor Bartolo. Beaumarchais continued their story and in Le nozze, the Count is now married to Rosina but their marriage is in trouble because of his philandering. Figaro is no longer a barber and is now the Count’s valet engaged to Susanna the Countess’s maid and the Count’s intended conquest. Bartolo is seeking revenge on Figaro for stealing Rosina away from him, with the help of the rather oily music-master, Don Basilio. Helping add to the fun are Cherubino, a love-struck teenager, Marcellina, a blackmailing former duenna, Antonio, a drunken gardener and Barbarina, his young daughter. This is more than enough for a ‘folle journée’ – a crazy day indeed. The Royal Opera’s new director, Kasper Holten, reminds us in his programme ‘welcome’ how ‘One of the great stage directors of the 1970s and 80s, Götz Friedrich, used to teach Opera Stage direction … And he used to put his new students to a test: if somebody could tell him the story of Figaro in one go without making any mistakes, he would pay them 20 D-Mark. According to the story, he never had to pay.’ Perhaps the above will help any future aspiring opera directors? The most inflammatory passage in Beaumarchais’ original play, and cut out of the libretto, is an attack on privilege based on birth. This is only subliminally present in Mozart’s version but what is more central to the play’s plot – and subsequently to the opera – is the idea of droit du seigneur which allowed noblemen to sleep with their female servants on their wedding night, even though the practice had been defunct for centuries. If Beaumarchais did not exactly see the French Revolution coming, his play reflected what many educated Frenchmen were thinking at the time. 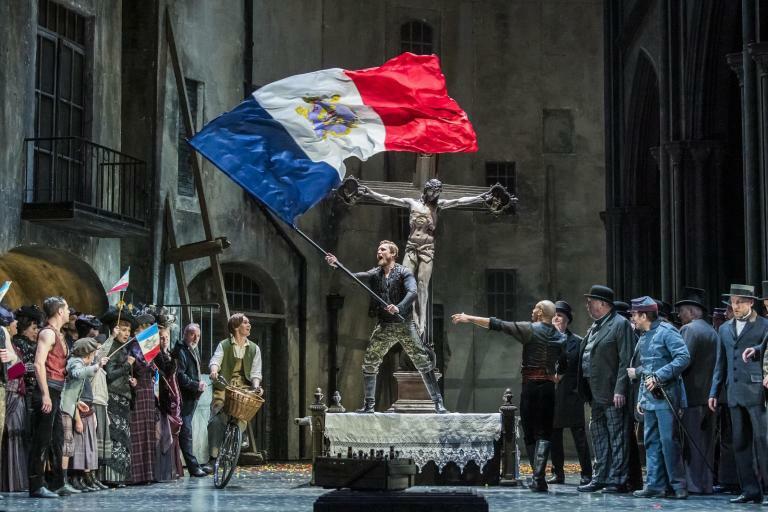 In what is clearly one of the classic opera productions of this generation – and with Tanya McCallin’s handsome and realistic designs and Paul Constable’s evocative lighting – McVicar updates the opera and sets it in – as he has described – ‘a French chateau in 1830’. The overture is accompanied by onstage business, including a wonderful vignette by an elderly maid mopping the floor and she returns and takes centre stage at the curtain call. First shown is a sumptuous long, window-lined, gallery and then Figaro and Susanna’s bedroom moves smoothly onto the stage, it is basically bare and awaiting for the newlyweds to move in together. The Countess’ bedroom is a little sparsely decorated but suitably evocative of the period, whilst the final act turns what has been ‘a hall in the castle’ into a hint of a garden setting by involving lowering trees and falling leaves. This provides the backdrop for the mistaken identity denouement, involving the Countess and Susanna in disguise and ends with the Count tricked into submission and begging his wife’s forgiveness. The excellence of what was happening on stage was matched by the exuberant conducting of Antonio Pappano, perhaps his finest moment ever for me at Covent Garden, in my opinion. It is probably the nature of the job but he often seems to spread himself too thinly over repertoire for which he may not be temperamentally suited but here the orchestra was immaculately prepared with a nod towards ‘authenticity’. The pacing was assured and everything was phrased perfectly. Pappano also played the recitatives on the harpsichord and this was a real homage to the performance practice of Mozart’s time. Now for that ‘ensemble’ of singers, and even if not all were the finest voices you could hear in their roles, with their evident chemistry this did not matter as much as it might. Any weakness there was involved the Almavivas. The up-and-coming American soprano, Rachel Willis-Sørensen was ‘young playing old’ as a disconsolate Countess, initially an affecting, tragic figure. Her ‘Dove sono’ was very poised and heartfelt and her singing went from strength to strength during the evening. Her Count, another American Lucas Meachem, was suitably imperious and commands the stage because of his sheer physical stature. Although his Act III aria was strongly projected his baritone voice revealed a few rougher moments than I would have liked. Ildebrando D’Archangelo returned as Figaro, the part maybe suits a lyric baritone rather than his rather dark bass-baritone but with a winning personality his Figaro has things happen to him rather than being a true catalyst of the happenings we see. Perhaps this is McVicar’s idea for his character? Considering the bass quality of his voice reminds me that one of the first singers of this role I saw in the 1980s was John Tomlinson who at that time was a promising young singer – I wonder what became of him. Also reprising her role in this production was Anna Bonitatibus as a charmingly cheeky and as boyish as possible Cherubino. Portuguese Jette Parker Young Artist, Susana Gaspar, was a charming Barbarina in a role no good singer can really fail at. Once again there was a veritable United Nations of singers involved and it reminds me how many Americans we see singing at the Metropolitan Opera and how few British singers appear at Covent Garden. If they do they are in character roles and here veteran singers gave wonderfully committed and nuanced portrayals; Ann Murray was Marcellina, Bonaventura Bottone as Don Basilio and Jeremy White as Antonio. I know Carlo Lepore was good as Bartolo but was there no one closer to home than Italy who could have sung this? I leave the best for last and that is Aleksandra Kurzak’s Susanna, her Act IV ‘Deh vieni, non tardar’ was stunning and indicates that everyone should see her in Figaro while they can – if she is as good with angst as she is in comedy her beautiful silvery soprano voice must be destined for more significant Verdi, and possibly Puccini, roles in years to come. She is the complete actor-singer and was clearly the stage-manager for the events of the whole opera, and she valiantly endured all the groping and controlled everything with a winning smile and an abundance of innate charm that they cannot teach in the music college. With matters of illicit love, passion, social climbing, alongside the responsibilities and inequalities of privilege, Le nozze di Figaro has much in common with the current international success of TV’s Downton Abbey, also about the machinations upstairs and downstairs of inherited wealth and their servants. In fact, with the sophisticated style of this Le nozze di Figaro staging and the performances elicited in this revival directed by McVicar’s movement specialist, Leah Hausman, it could almost have been Downton Abbey –The Opera. Le nozze di Figaro will be broadcast on BBC Radio 3 on 26 May at 6pm and for details of remaining performances go to www.roh.org.uk.